The teaching component aims to develop resources to assist both network members and other scholars to teach issues at the intersection of IP and human rights. Issues pertaining to IP and human rights must find their way onto policy agendas in an informed and sustainable manner, and the academic field must be further developed. In order to address this, the ASK Justice project placed emphasis on the need to institutionalise teaching and learning around IP and human rights in African universities, and to contribute to the development of a new generation of scholars. By integrating the human rights angle into mainstream IP course offerings, the project will strengthen the sustainability of teaching, research and public voice on these issues in higher education in Africa. 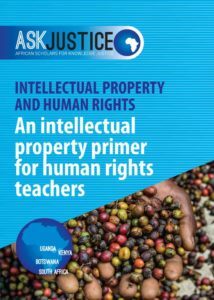 As such, the ASK Justice teaching team was tasked with developing university-level course material to be used to educate students about interlinkages between human rights and IP. 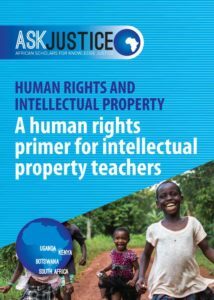 The need for this kind of material was regarded as particularly important at the time of the conceptualisation of the project since there was a significant absence of IP and human rights courses or programmes offered in Africa. Besides the courses on human rights and IP developed in 2013 by the Universities of Makerere, Nairobi and KwaZulu-Natal, funded by the OSF, the only other programmes in existence at the time were a human rights course that covers A2M offered by the University of Pretoria, and an IP Law and Development course offered by the University of Cape Town, based on findings from the Open AIR network. 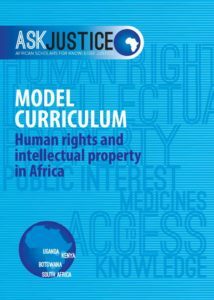 The expected outcome of the course materials developed by the ASK Justice teaching team was that educators in developing countries in Africa and elsewhere would have a substantial basis upon which they could introduce issues of IP into (existing) courses on human rights as well as human rights issues into (existing) IP courses, and to create or modify courses to include issues at the intersection. It was also expected that educators would easily and rigorously be able to evaluate existing degree and course curricula for inclusion in this subject area. Following the initial background and structural work spearheaded by the teaching Theme Leader, Naomi Njuguna, a workshop was held in Entebbe in October 2017 where the teaching team worked collaboratively towards finalising the draft course and associated materials. The main objective in the development of the Model Curriculum was ‘Creating a Network of Excellence for Teaching and Practice in Africa: human rights, and the Public Interest with a Focus on A2M and A2K’. 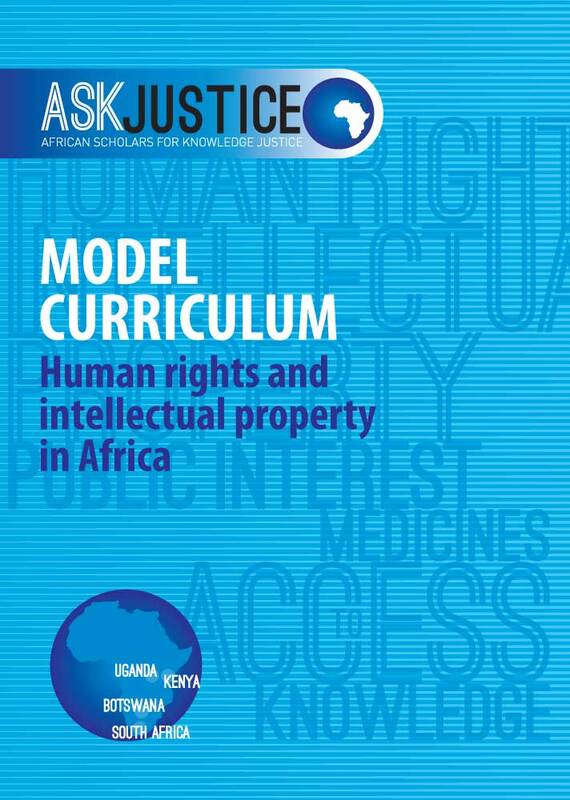 The Model Curriculum, which is designed for use in conjunction with the two Primers, serves as a guide for IP and human rights lecturers on how to approach the intersecting issues of these two fields of practice and law at African universities and other educational institutions. to explore advocacy and other public voice mechanisms to ease the tensions around A2M and A2K. Comprising seven modules, the Model Curriculum begins with an introduction to the basic concepts underpinning IP, human rights and their intersection, and thereafter explores the interrelationships between the international, regional and national regimes as relates to these concepts. The Model Curriculum further enumerates the impact of the concepts on A2M and A2K in the developing world context and considers the role of advocacy. The Model Curriculum lays out the objectives, expected learning outcomes and course content of each module, and provides a list of essential readings to further aid lecturers and students as they interact with the curriculum. The essential reading list consists of materials obtained from open access platforms, making the materials available to a larger audience. The curriculum has been designed so that delivery of the course can (and should) depend on the unique circumstances of each institution or individual that seeks to utilise it. The depth of the content will be determined by the level of learners (e.g. the level of instruction between an LL.B programme and an LL.M programme would be different). The Model Curriculum is designed in a such a way that a variety of instructional methods can be employed, such as lectures, seminar-style workshops, tutorials and online lectures. learn how to use advocacy and other public voice mechanisms to highlight the issues at the intersection of human rights and IP rights. The team is in the process of developing two primers on IP and human rights. Both will offer an introduction to the way in which human rights and intellectual property are interrelated, but one will be optimised for an IP course and the other for a human rights course. We are preparing a curriculum review tool that will enable scholars to review a given curriculum to determine to what extent it covers essential human rights concerns around IP. Academics will be able to use the tool to establish to what an extent a degree such as an LLB or LLM teaches students about issues at the core of IP and human rights. Utilising expertise developed by the University of Nairobi, this tool will enable peer review of course offerings as well as self-assessment and evaluation of teaching methodology. 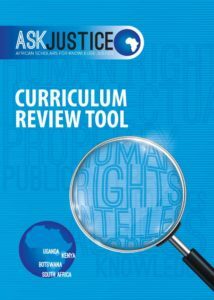 Once the curriculum review tool is available, we will publish a paper discussing the processes involved in producing it. By integrating the human rights angle into mainstream IP course offerings, the project will strengthen the sustainability of teaching, research and public voice on these issues in higher education in Africa. All resources produced for the Teaching component of ASK Justice will be open access under open Creative Commons licences.